Season 1: Xiao Yan Zi met Xia Zi Wei, a poor girl who marched a long way to find her father, the Emperor, but nobody would take her seriously. Xiao Yan Zi decided to sneak into the mountain where the Emperor hunts, but Zi Wei could not handle the tiring mountain climb, therefore asking Xiao Yan Zi to tell the Emperor her story. On her way, Xiao Yan Zi gets shot and could not fully explain her story, making the Emperor mistaking her for the Princess. Here starts a long and painful story of getting everyone to their proper roles, but many dangers lies near – the death sentence if anyone lies to the emperor, and an evil Empress who is waiting to catch Xiao Yan Zi in the act. Added on top, Xiao Yan Zi’s lack of proper manners and knowledge of books has driven her closer to jeopardy. Season 2: Our beloved fake princess returns for the second installation of the series. This time she is the fiancee of the Fifth Prince, but her life will be far worse off. The emperor's mother has returned from praying in the temples and she is appalled by all the changes that the emperor has made; it was bad enough that he adopted a daughter from the commoners but also found wives for the Fifth prince and Er Kang, who she wanted to marry his maid Qing Er to. To top it all off, Xiao Yan Zi's nonsense and no sense of palace rules has driven the Grand Empress over the edge. She is determined to drive the two girls out of the Palace. At this time, the beautiful daughter of a bordering nation - Han Xiang was "given" to the emperor as a prize so that the two nations will stop fighting. Han Xiang has a specialty that she gives off a sweet odor naturally. The emperor falls head over heels for her but unfortunately, Han Xiang already has a lover, Meng Dan, who is determined to get her back. Meng Dan fortuitously meet Xiao Yan Zi and the gang and for the love for sword fights they became close friends. Xiao Yan Zi decides to help them and sneak Han Xiang out of the palace. For this crime the emperor could take no more so he orders for the death of Xiao Yan Zi and Zi Wei. 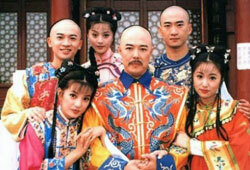 Wu A Ge, Er Kang and the gang sacrifice their positions and lives to save the two princesses and run for their lives. On their journey they are being helped by Xiao Jian, who are helping them for no reason but seems to not like the emperor very much... and what is with his special treatment for Xiao Yan Zi? The Empress, who still hates them used this chance to order secret assassins to kill the whole crew... Will they survive and be returned to their original positions? Season 3: In the third installment of the series, the Grand Empress has come back for another run at the gang. At the frustration of Yong Qi's lack of heir, the Grand Empress has made Yong Qi marry another girl so that he may produce a son and maybe one day become the emperor. Xiao Jian, Xiao Yan Zi's brother is in love with Qing Er, but he has a grudge with the emperor for killing their parents many years ago. Since Qing Er is a popular person in front of the Grand Empress, her marriage is within the empress's hands. In order for them to be together, Yong Qi must marry the other girl. Yong Qi chose to be the hero and sacrificed himself so that Qing Er and Xiao Jian could be together. What is worse is that the nation bordering China is going into war and Er Kang became drafted. During one of the big battles he loses his memory and falls for another girl. Will Er Kang return to Zi Wei? Will Yong Qi fall for his second wife? do you have a link for download??? This is like Harry Potter, childhood memories..
Miss the ending theme song so much! OMDS brings bak alot of childhood memory!! cud not stand the new version of HZGG!!! love the 4 original main lead!!! yea same. i grew up watching it. my childhood memory is all filled with HZGG. watched countless of times but still i want to continue watching it! OMG THANK YOU SO MUCH FOR UPLOADIN THIS!!!!! I CAN NEVER GET TIRED OF WATCHIN THIS!! BEST SHOW EVER!!!!!!!!!!!!!!!! I hope that there will be season 4 for this ORIGINAL version with all the original actors and actresses in it. Especially Zhao Wei ! I am presently learning Chinese language and the culture. I found it entertaining and amusing. They speak clearly, it makes it easy for me to catch few words. I will continue watching the episode and one day I’ll understand it all! i lost count of the number of times i’ve watched this awesome drama. this show is damm nice . but how i hope they can re shot part 3 with th original actor . because when i was watching part 3 ii didnt really watch it . ii keep on skip cox ii dun like the actor . but ii really wann to know th story n th ending . really hope someone would help me tell my request . =_= right.. just because you wanna know the ending, they have to go and find the original actors and actresses and film for another 3-5 months… i’m sure. stop dreaming. I’ll get right on it…as soon as you transfer the $50 million USD it requires to reshoot season 3 into my account. Because this was created in 1998-2001. Learn Chinese then you wouldn’t need to worry about subtitles. Everything was awesome till season 3–I hated the new cast. And the 2011 remake was horrible. Exactly. The story was horrible. And I’m so glad that they didn’t use the old cast for series 1 & 2 for the third series. That 2 heroes should be replace by somebody else let say ekin chen, rain..? haha. jet li too..
what was the series on ntv7 year 1990’s comedy drama about the emperor masquerade in the village of his kingdom even get beaten by the villages and corrupted officers of the villagers he visited? i love this drama series.. anyone? i personally think season 3 was actually very good. i loved the actors especially xiao yan zi and yong qi. they had a reason to change the cast because the characters are supposed to appear more mature. the original actors zhao wei, su you peng, and lin xin ru had too much of a baby face. the season 3 actors tried their best and they did an amazing job. i just think the new version was really bad…its like a bunch of kids who has no acting experiences. the storyline is bad and even the emperor was horrible….just my 2cents and opinion since i grew up watching this lol. No. The story for series 3 was horrible. Most characters were written changed so much and so badly. I couldn’t stand watching the original cast did everything in series 3. I feel that season 3 is good eventhough the cast was changed.The story plot and acting skills are excellent but maybe too mature and serious for some ppl.However, pls just imagine that if you didn’t see season 1 and 2 before, would you have such bias opinions on season 3? Besides , HZGG should be appreciated for its story line not just the cast.Personally , i like both xiao yan zi but love the story plot the most. It’s nuts how i never get tired of this drama since when it first came out in 1998. watched the newer version, but still love the 1998 one better maybe bcos i grew up with it! 🙂 season 3 of the old version is just too sad for me, so i prob wont like it as much even they had the original cast for it. err… no. chinese is language, mandarin chinese is one of the many spoken forms of chinese. so if u could read chinese sub, you don’t need eng subs. so technically, he’s correct. Nothing beats the classic. I guessed the impression the pioneer cast left was just too impeccable. omg this must be the hundredth time i’ve visited this page i have literally memorized every line of this drama. season 1 and 2 were the best 3rd season, the actors didn’t do it any justice and the storyline wasn’t that great either because half the main cast left the emperor. and the emperor is uncharacteristically unlikable. I prefer the main cast and plot of the previous 2 seasons. somehow I can’t bring myself to watch season 3 from start to finish. the series was adapted from novels written by qiung yao. as far i i know, there 3rd season was created because many viewers ask for more story about qing er and xiao yan zi’s brother. unfortunately most of the main cast got contract to do other jobs at the moment. i do thought the 1st and 2nd season was the best. I watched this when I was a kid! and used to love it 😀 recently the NEW my fair princess came on tv, so I started watching that.. I really like the NEW xiao yan zi and yong chi x) so I personally prefer the new version better! But the old one is still good because its the first one! the new version is just completely the same except they had Benjamine the new actor in there!! XD either way, on the whole. My fair princess the new or old one is a really good story itself! Are there english subs for the seasons anywhere? onde encontro para ver online??????? ?